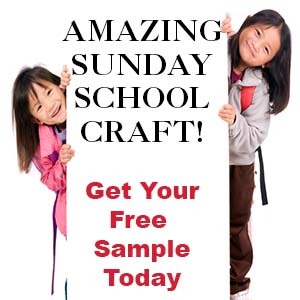 The following crafts and activities come from the Bible lesson "Jesus, the Missing Piece" on The Resource Room availalbe to members on "The Resource Room". Teaching Concept: Life without God is like a puzzle with a missing piece - It is incomplete. 1. Before class print out the Missing Piece Activity Sheet and make copies. 2. In class have your children try to draw in the missing piece or what they think the missing piece might look like. 1. 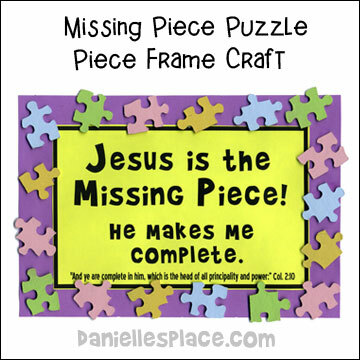 Before class print out the "Jesus is the Missing Piece" patterns onto colorful paper and cut them apart. Glue them to half sheets of construction paper. 2. Spray paint the backs of small puzzle pieces with several coats of paint and let them dry. (If you don't want to spray paint puzzle pieces, you can just use puzzle pieces from an old puzzle. You can buy used puzzles very cheaply at second hand stores. 3. 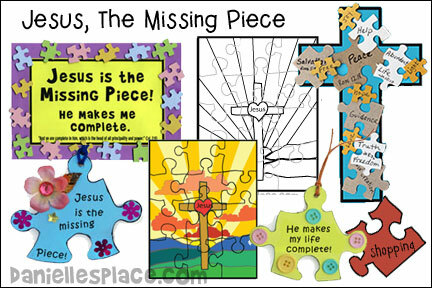 In class have your children glue the puzzle pieces around the edge of the "Jesus is the Missing Piece" picture. During the opening activity have your children work in groups putting puzzles together. Before class remove a puzzle piece from each puzzle. When the children have finished putting their pieces together and find out they are missing a piece, talk about how the missing piece is very important to the whole puzzle, and how it affects the whole picture. Ask your children to look for the missing piece on the floor, chairs, under things, etc. If you have time have your children try to make a puzzle piece from cardboard to replace the missing piece. Print out the puzzle pattern and cut the pieces apart. Print out the extra pieces pattern and cut them out. Print them out on to card stock and then glue them to a piece of card board or a craft foam sheet with Elmer's No-Wrinkle Rubber Cement. The craft foam gives you a thicker puzzle and the pieces don't slide around as much and it is much easier to cut out than thick cardboard. Use the puzzle as a visual during the lesson. Put the puzzle together except for the middle piece that has the word "Jesus" on it. Puzzles can be fun to put together, but isn't it disappointing when you come to the last piece and realize that you are missing a piece? That one missing piece ruins the whole puzzle. A puzzle isn't worth much with a missing piece. You might as well throw it away. I don't know of anyone who would want to put a puzzle together if they knew there was a missing piece. No other piece will fit into the empty space except the original piece. You can try and make a new piece from cardboard, but I bet no matter how good of an artist you are, the piece will still not be able take the place of the lost piece. 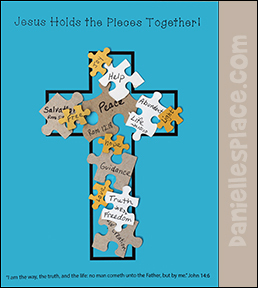 Did you know that a life without Jesus is a lot like a puzzle with a missing piece? We were designed by God to have a relationship with him, but because of sin, Adam's and Eve's sin, man was separated from God. Children match the pieces and write the corresponding words onto the puzzle picture. 1. Before class paint the back and fronts of the puzzle pieces with different colors of paint, and drill or punch holes in the pieces so that a string can be attached. 3. In class have your children write "Jesus is the Missing Piece" on one side of the puzzle piece and "He Makes My Live Complete" on the other. They can also add the Bible reference if they have room - Col. 2:10. Have your children decorate the pieces with buttons, beads and other decorative items. 4. To add a string fold the string in half and stick the looped end through the hole in the puzzle piece. Bring the ends of the string through the loop and pull the ends until they are tight. Tie the ends together. Before class put together several children's puzzles on a sheet of paper. Turn the puzzles over by placing another piece of paper or cardboard on top. Pick up the puzzle and the paper and turn over the whole puzzle. Write the Bible verse in large letters on the back of the puzzles. Break up the puzzles and place them in separate bags. In class spread out the puzzle pieces and turn over any pieces that are upside down. Break your children into teams of three or four and see which team can put their puzzle together first, turn over the puzzle, and read the Bible verse that is written on the back. Don't give them ideas on how they can turn over their puzzle. Let them try to figure out how to do it on their own. After the game you can have the children try to put the puzzle together with the pieces upside down using the Bible verse. Explain to your children that a simile is a comparison of two unlike things using the word "like" or "as". The Bible uses many objects to explain the characteristics of God. For example, he is compared to a shepherd, a physician, a vine, light, bread, and a groom. Saying, "Life without God is like a puzzle with a missing piece" is using a simile because we are comparing two unlike things. Below is a list of some of the things the Bible uses to describe God. 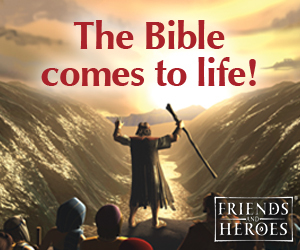 You can have your children look up the verses and fill in the simile "Life without God is like . . . using the following references. For example, the first one would be: "Life without God is like a sheep without a shepherd." 1. A Sheep Without a Shepherd - Psalm 23 - Sheep need their shepherd; We need someone to protect and lead us. 2. A Sick Person Without a Doctor - James 5:14-16 - We need someone to heal us physically, spiritually, and mentally. 3. A Person Without Food - John 6:26-35 - Without food we will starve; without spiritual food we will die spiritually. 4. A Day Without Light - John 8:12-20 - Without light we cannot see where we are going; without Jesus our life has no direction. 5. A Bride Without a Groom - Isaiah 62:5 - A groom rejoices over his bride; God will rejoice over you. 6. A Runner Without Race - Acts 20:24 - A runner without a race has no purpose or doesn't know where to run; our life is a race and our goal is to finish the race by completing the tasks that God has given us. 7. Clay Without a Potter - Isaiah 64:8 - Without a potter clay is just a lump of dirt, God is our potter he forms us into something useful. He gives us purpose. 8. A Lost Sheep Without a Shepherd - Luke 15:1-7 - Without a shepherd a lost sheep cannot be found. God is like a shepherd; he will keep looking for us until we are found. He rejoices when we are back safely with him. 9. A Tree Without Roots - Jeremiah 17:7-8 - A tree without roots withers and dies, if we trust in God we are like a tree planted by water that sends out roots and can survive even in bad times. 10. A Sinner Without Redemption - John 3:16 - Without God's forgiveness we cannot receive eternal life. 11. A Branch Without a Vine - John 15:1-10 - A branch cannot produce fruit without being connected to the vine, we cannot accomplish what God created us to do. 12. A Child Without a Father - Psalm 68:5a - A child needs a father, God is our father. 13. A Soldier Without a Shield - Psalm 3:3 and Ephesians 6:16 - Without a shield a soldier doesn't have much protection,and without the shield of faith we don't have much protection from the evil one. You can also have your children think up their own similes such as "A life without God is like a fish without water": An Airplane Without the Sky, A Book Without Words, A Well Without Water, A Church Building Without People, etc. This craft can be used as a hands-on activity to teach children about how Jesus helps us in our daily lives. 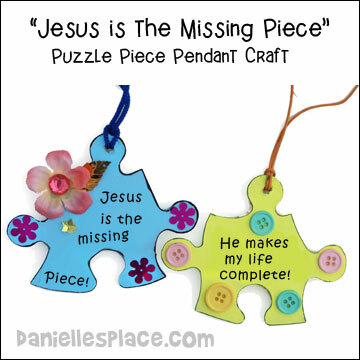 Children look up Bible verses, discuss the verse, write a word that describes how Jesus helps us, and then glue the puzzle piece to the picture. 3. Pick a child from each group to talk about the verse and then have all your children pick a puzzle piece and write a word from the verse that describes how Jesus helps us. Then have them glue it to the cross picture as shown in the picture above.